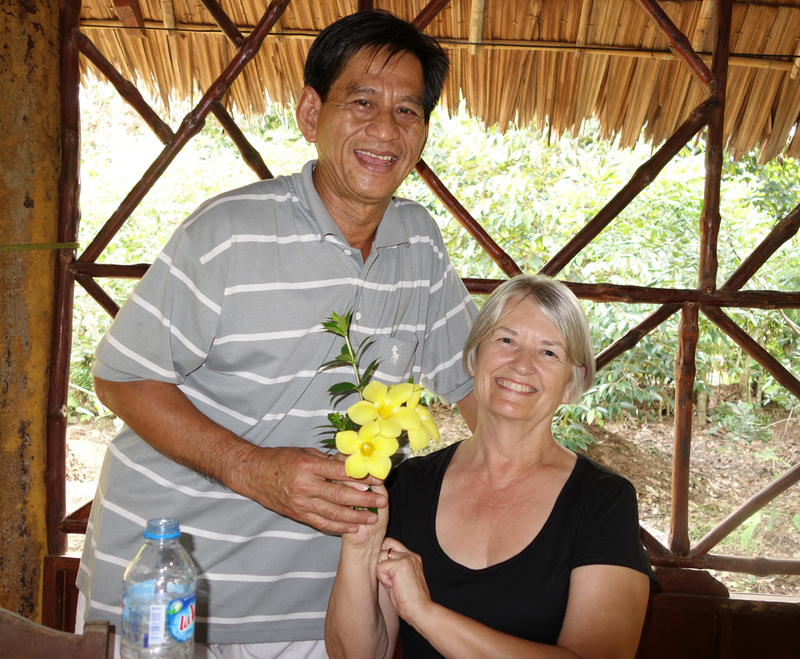 From Chau Doc we drove the next day to the town of Vinh Long, through more peaceful countryside and small towns. 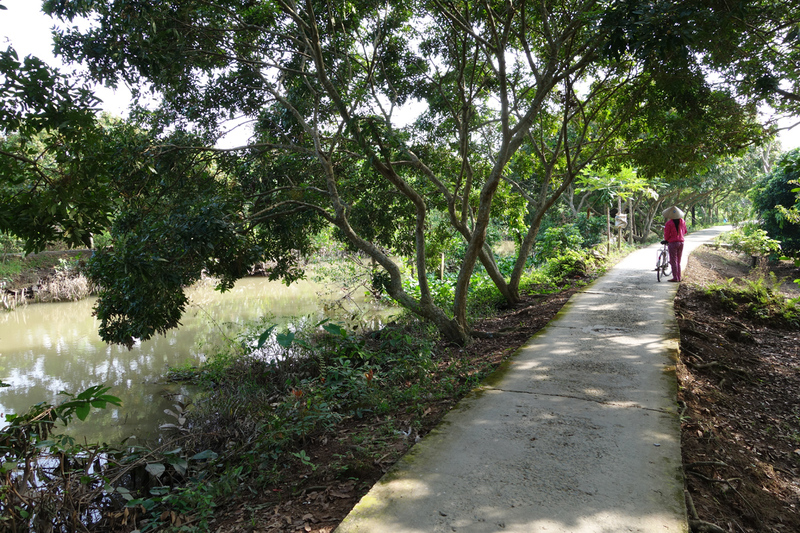 About hallway through this ride we made a stop along the way – – to see, of all things, a crocodile farm. This was amazing: 10 or more large ponds holding more of these creatures than we could count, growing up to be a handbag or expensive foot-ware. 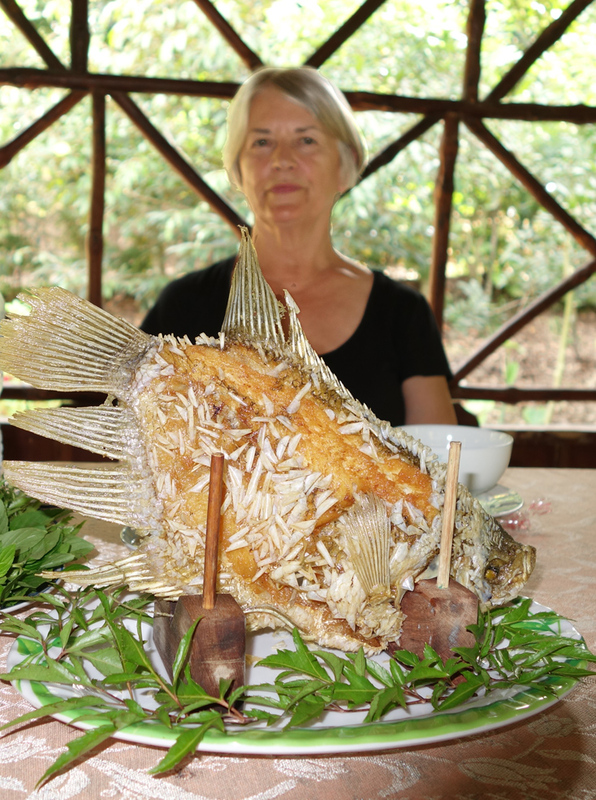 We learned that this is an extremely profitable business venture for a prominent Vietnamese lady who also has a corner on the local fish market. It was a fun respite from our car ride. They even had a kennel there with a number of beautiful dogs! This large facility had a collection of huge meeting rooms and restaurants: evidently, this is THE place to come and hold your special party or wedding reception. Go figure . . .
Two-to-three year old Crocs. Wish we could-a seen feeding time. 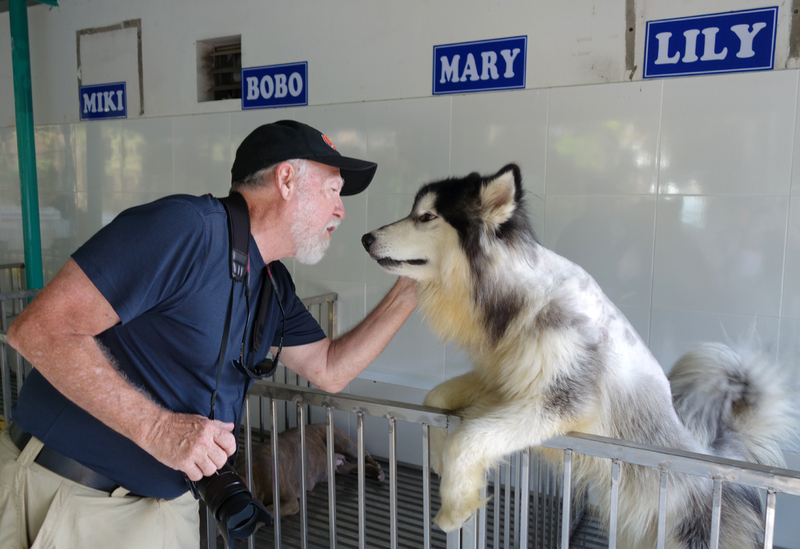 Gary was more interested in the pet dogs at the crocodile farm. ‘Lily’, a true Alaskan Husky, returned the affection. What is she doing here?! 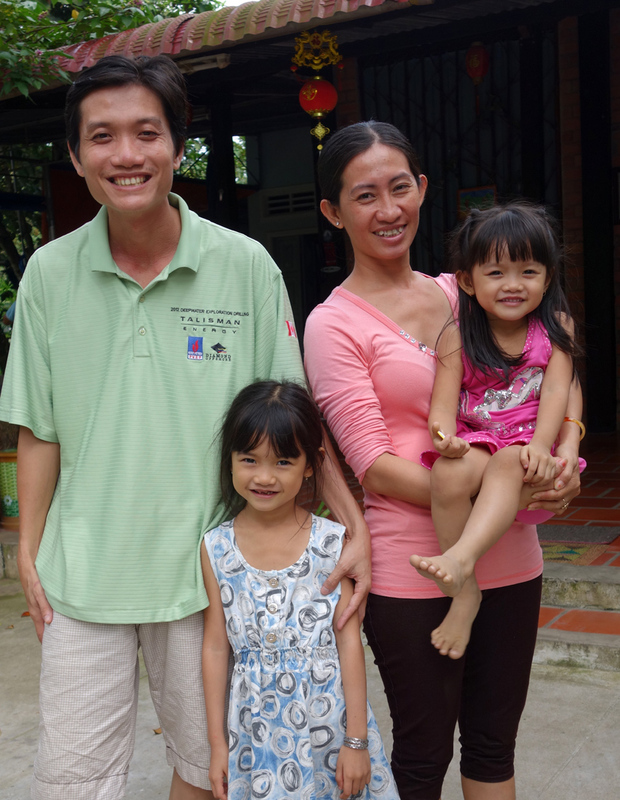 We arrived in the river city of Vinh Long late in the day, but just in time to catch a ferry across the main stem of the Mekong River to An Bihn island for a “home stay” (actually a guest house), where we were greeted by a lovely family with two beautiful little daughters. There were several other guests staying the night here; a party from Paris, and a couple from San Diego: we were served a lovely dinner at various dining locations around the garden in the warm tropical evening (and not a mosquito in sight). After a leisurely dinner it was off to bed – – on traditional platforms (plywood!) which were actually quite comfortable even without a big mattress. Guess we were really tired, eh? 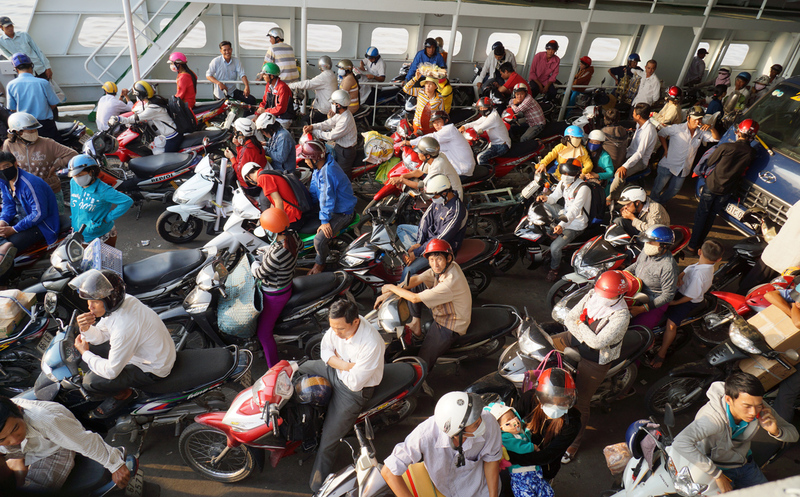 Taking the small ferry to An Bihn island. NO cars on the entire island. The host family. 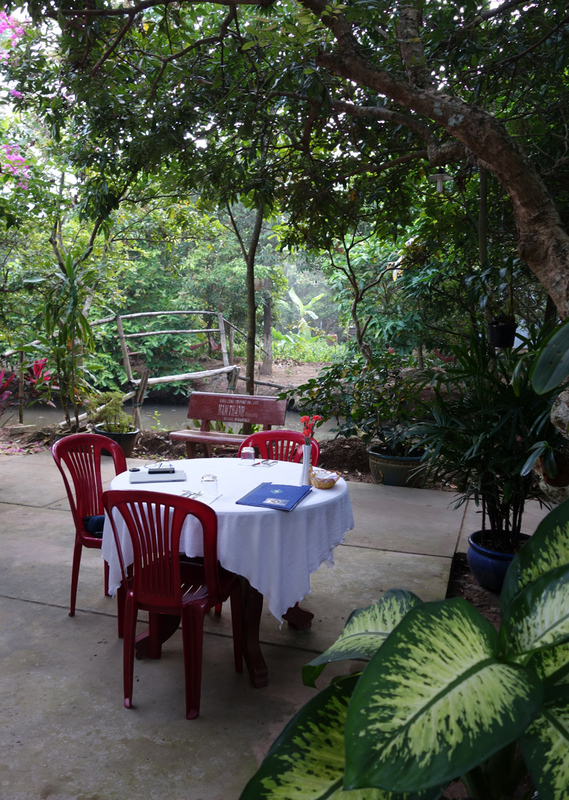 They run this ‘home-stay’ as well as a small fruit garden. 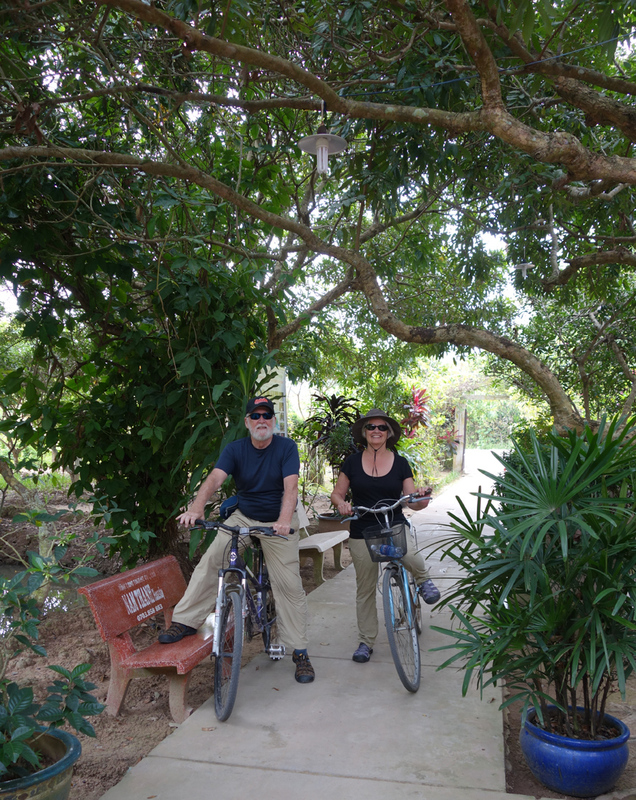 Our next day began with a bicycle ride along the paths and around the neighborhood on the north end of the island. Well, lets call them the “thoroughfares” of the island! Very narrow paths with motorcycles, scooters and bicycles passing us often: fortunately we didn’t ride off the path into the canals [ed.note: but Evie DID manage to veer off the path once when 2 moto’s tried to pass her at the same time]. Did I mention that there are no cars on this island? Thank the good lord! Beautiful plants and gardens everywhere. The farmers here make a pretty good living growing fruits that they are exported to China. The Chinese love these exotic varieties. Many of the homes were very beautiful and some even larger than we expected. Not a lot of room on the paths! 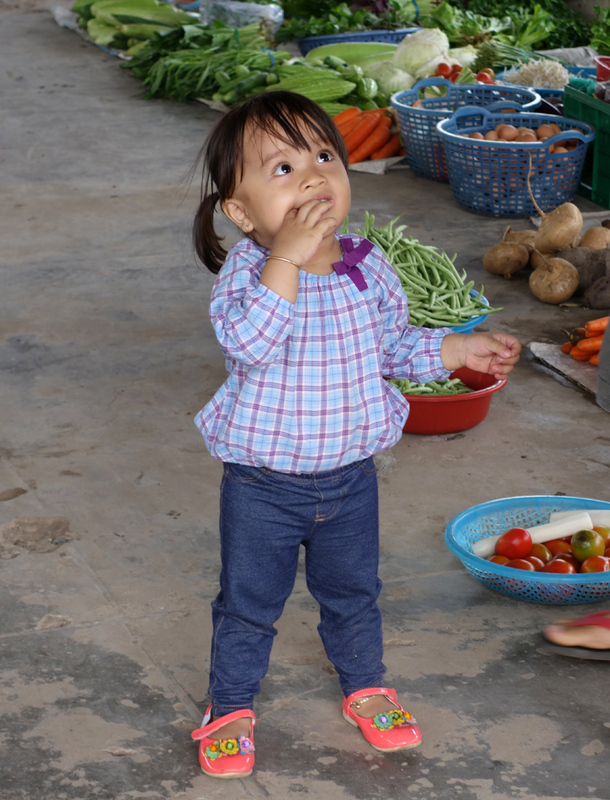 This cute little girl was my constant companion walking around a neighborhood market on the island. 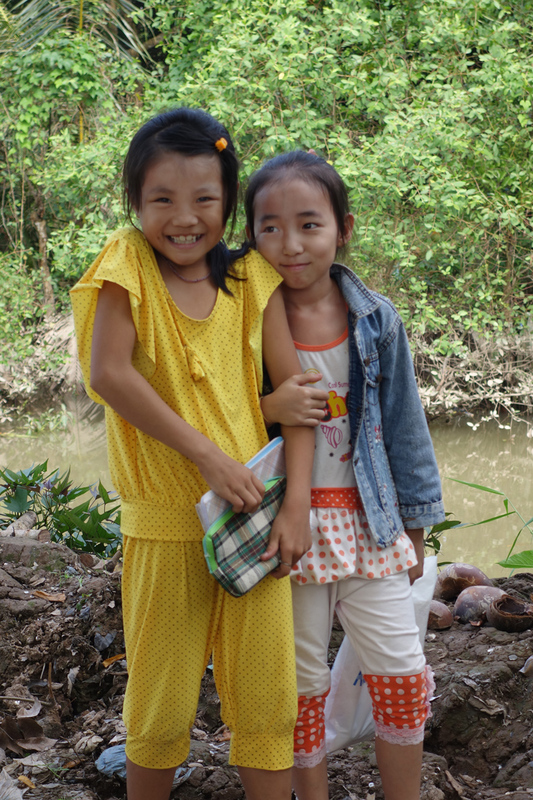 These are 2 lovely girls we encountered on our bicycle ride past their small school that had just finished for the day. 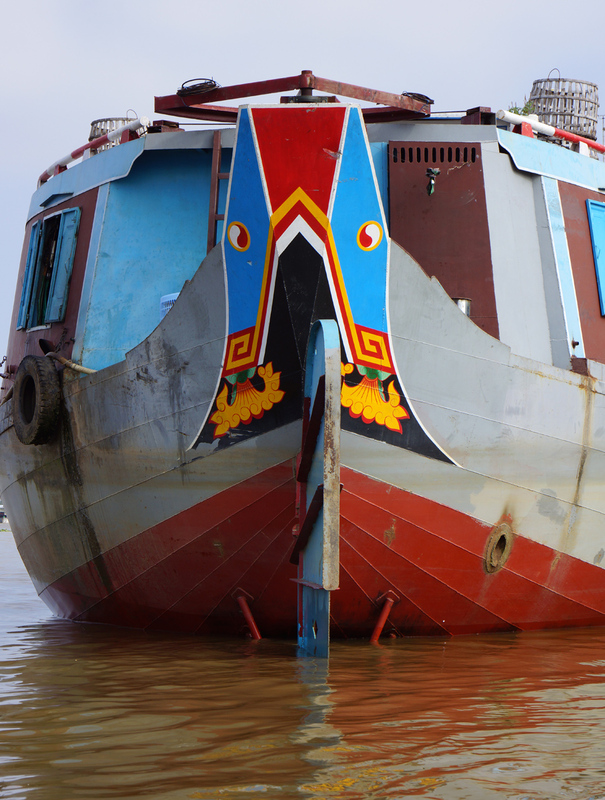 On the next day we took a lovely boat ride to the town of Cai Be, known for its unique floating market. There were over 40 boats lined up, or side by side, in the river channel and each had an upright pole from which they would hoist a sample of the item or items each family had for sale. People would motor over or row along-side to buy. 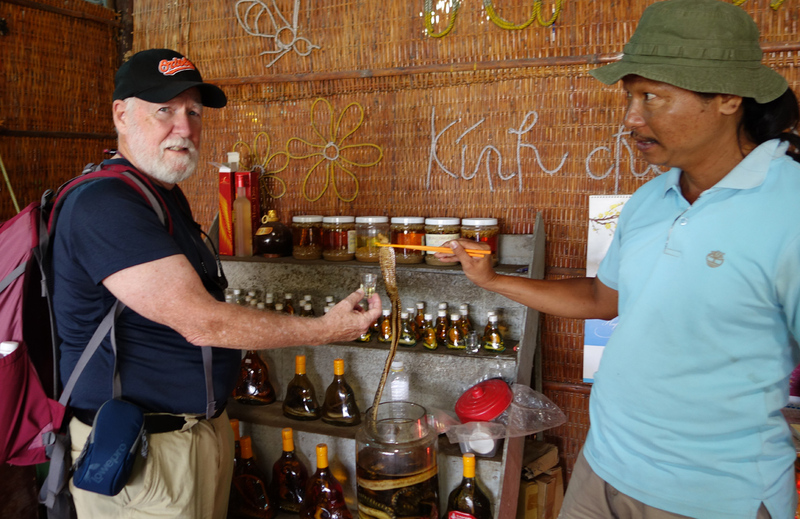 We were told that when they sold their goods like this on the water, they didn’t have to pay any government tax: so locals could get goods cheaper and the merchants could gain a larger market share. Sounds like Washingtonians crossing the Columbia River to buy tax-free goods in Portland! 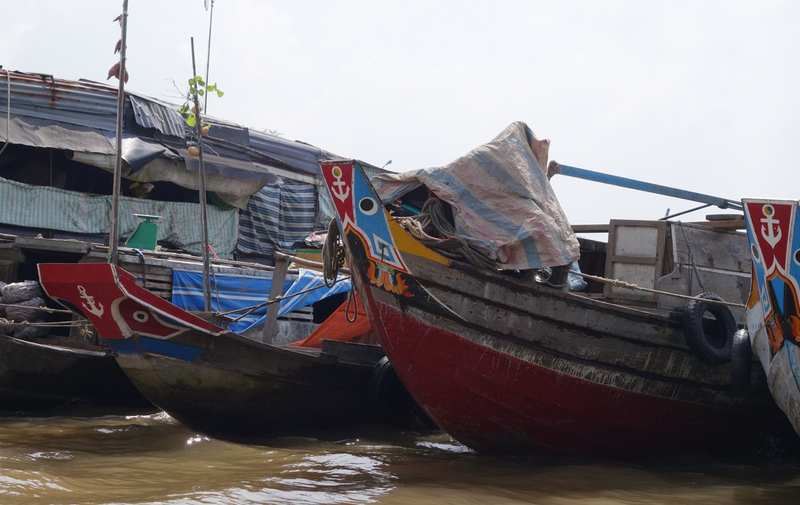 Most of them live on these boats, they just return to their home-town area to pick up more merchandise. 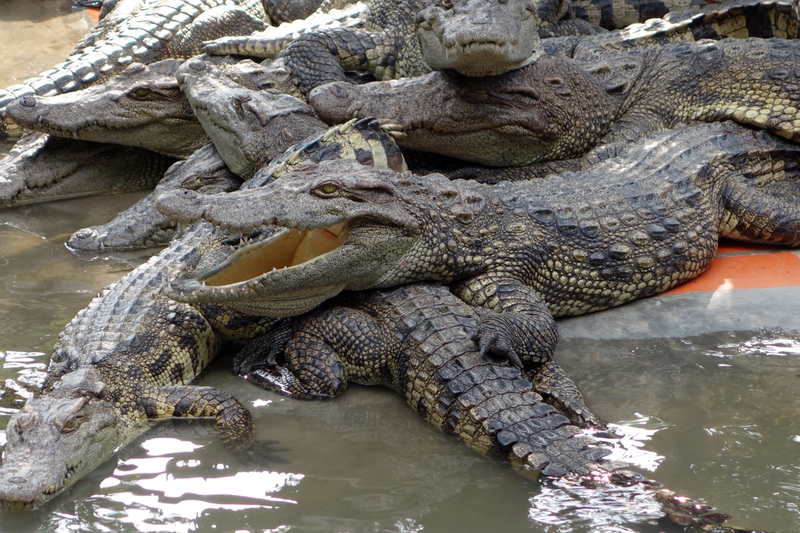 The eyes on the boat are those of crocodiles for protection. 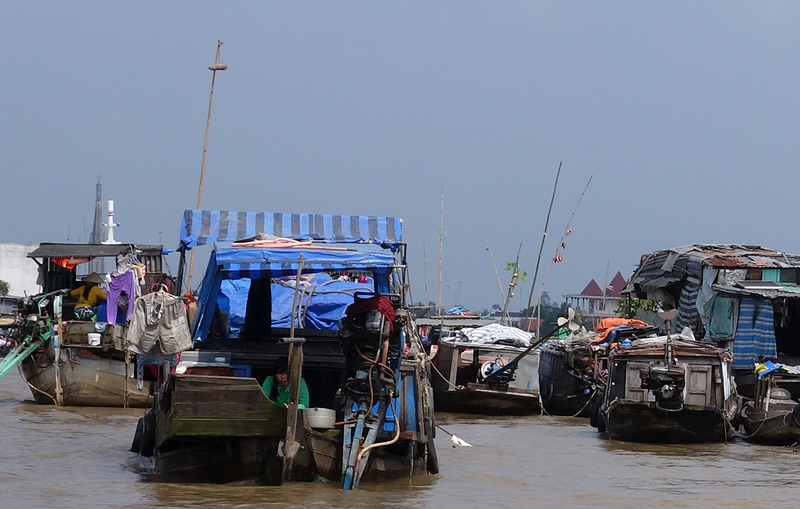 We got off our water taxi and visited a number of places along the Mekong, that made and sold local products like: rice paper, coconut candies, and “popped rice”. 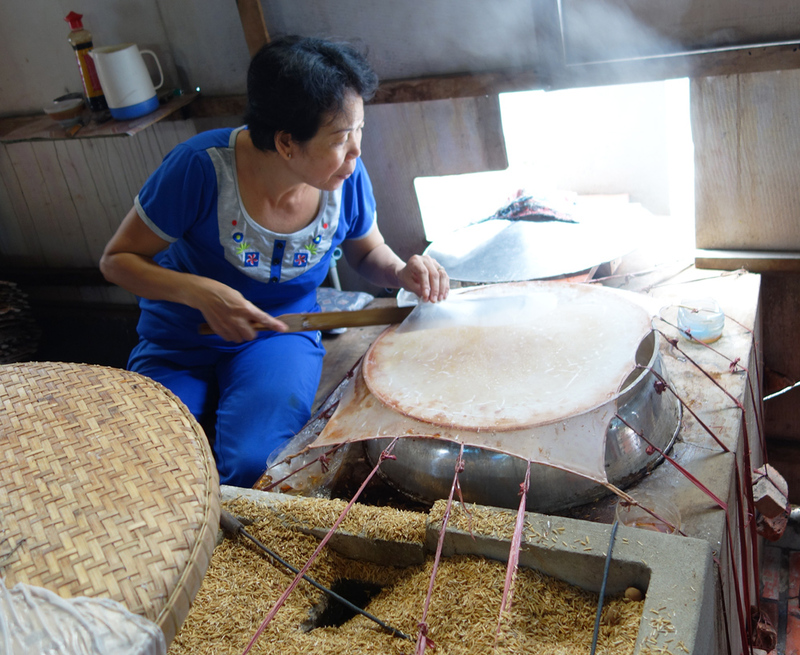 We sampled many and bought some to snack on later as we travelled to Ho Chi Minh City (I still have to call it Saigon!). Amazing how much they can transport by boat! 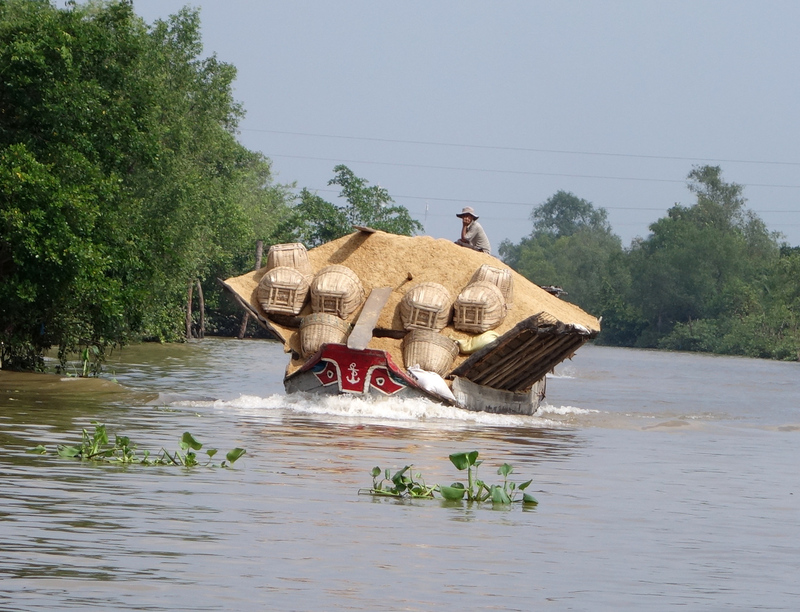 This is a load of dried rice husks that are headed to mills along the Mekong that use it to fuel their operations, be it grinding rice flour, making local products or compressing it into a form usable in local stoves. 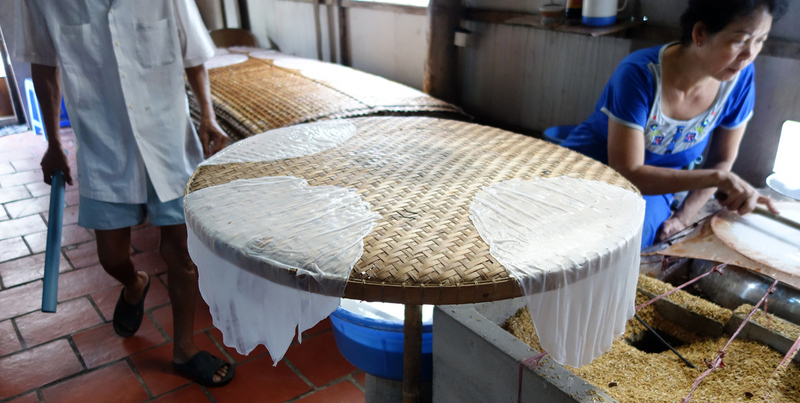 Cooling rice paper before putting on tray out back for drying. OMG! A seminal moment of the trip for Gary. 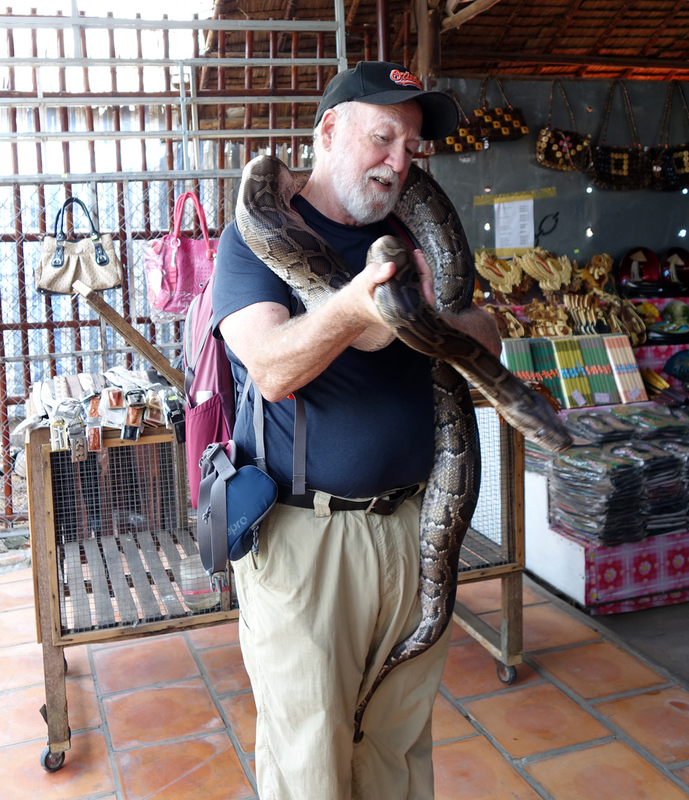 A ‘friendly’ Vietnamese python. No – – it really is a pet! Another boat-taxi ride this afternoon: to a family-operated lunch spot in their beautiful private garden. Another feast of Vietnamese dishes — spring rolls, noddles, fried fish, vegetables, fruit. So much to eat, but what wonderful favors. I don’t know how Long, our guide, finds all these remote places. He’s a touring guide genius. Our host was very gracious, and kept coming back with beautiful flowers to give to Evie. [ed.note: no one ever brings Gary flowers, or tells him he is handsome!] And more fruit than either of us could ever eat. 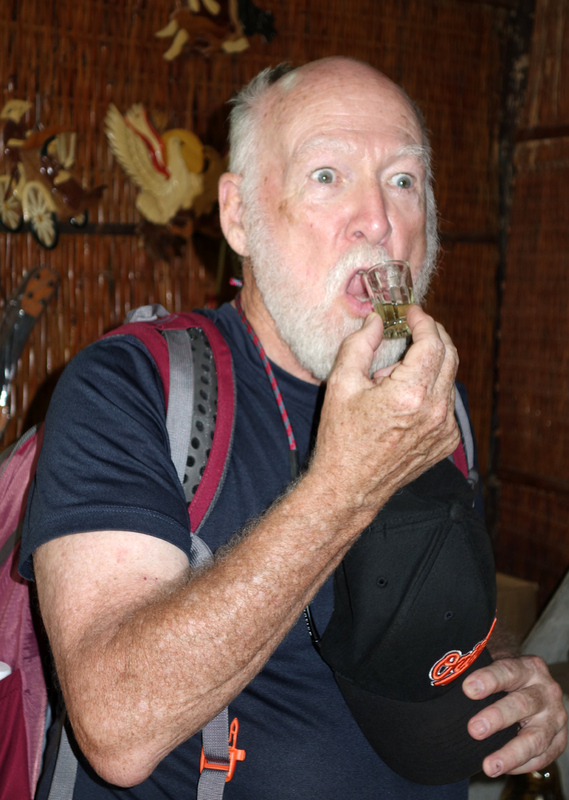 There also seems to be a tradition here in Vietnam that, if your host really enjoys your company, he serves you his homemade rice wine, at least three times, during the course of a meal. The actual toast: “Một, Hai, Ba: Yo!” That means: ‘one, two, three: down the hatch!’ The rice wine was uniquely different at each home, as everyone takes great pride in making their own from “secret family recipes”. This wouldn’t be the last time we participated in such wonderful drinking fun. Fried Elephant-Ear Fish — delicious! 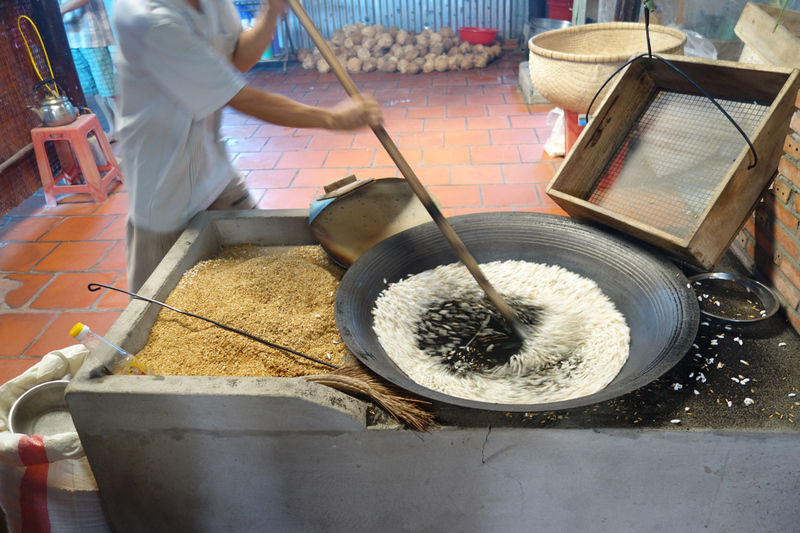 You can eat the crispy fins as well as the dried scales on the side. One host with one of the many flowers from his garden he would bring to Evie. A great tradition after the mid-day meal. Am finding it harder and harder to eat my way through Vietnam and still get enough exercise . 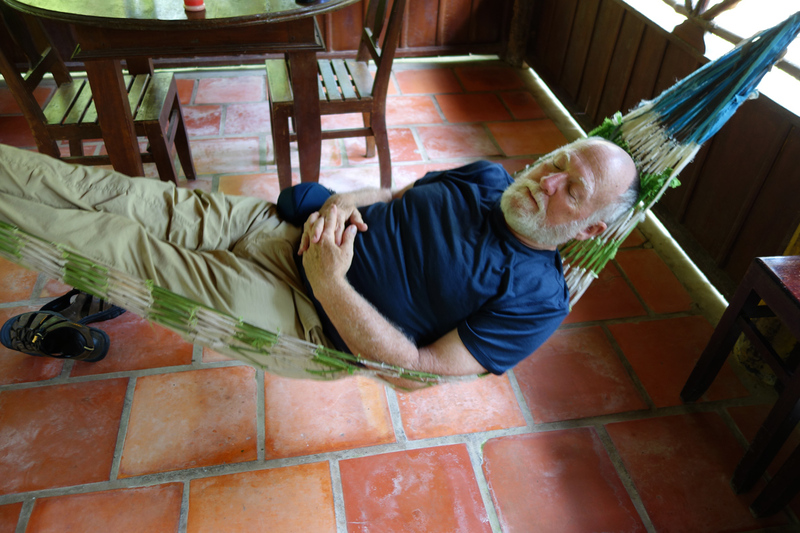 . .
We had a great rest in a hammock after lunch. 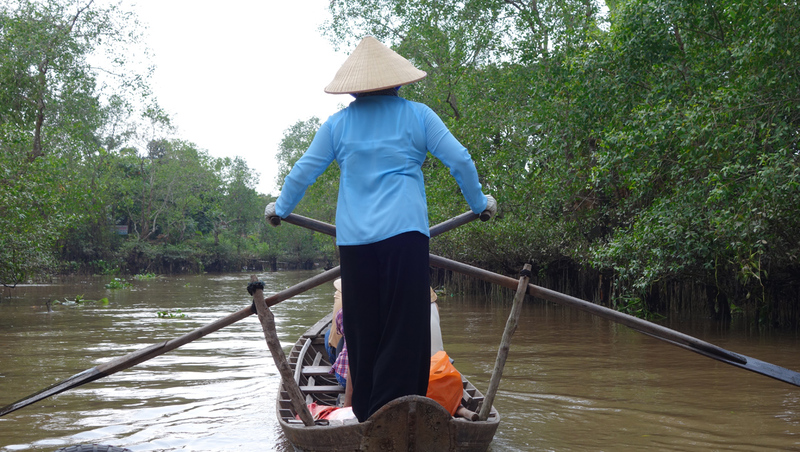 Next up in our busy day: a ride in a traditional sampan. 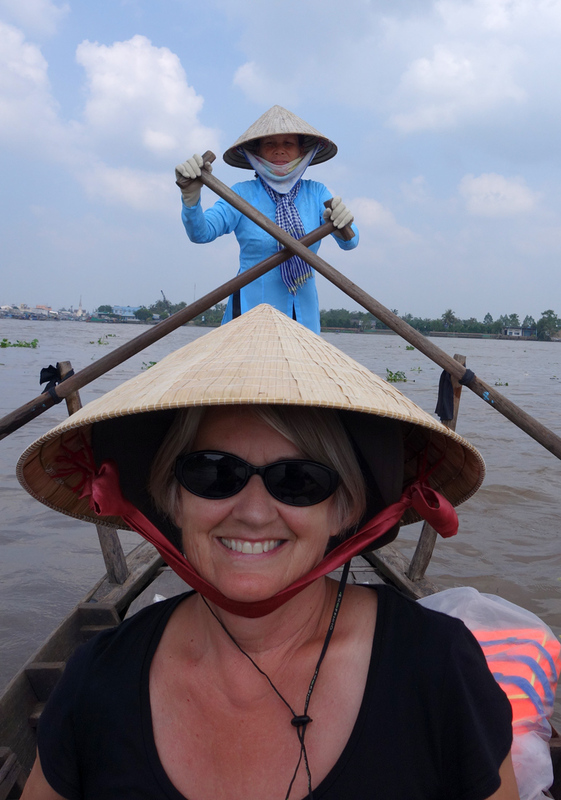 The woman who rowed ours was quite strong and fast. It was a great ride down a canal. Going down a peaceful back-water canal. These women, all older than middle-age, are experts with this craft. For some reason, this is the first posting I have seen. Maybe I was supposed to sign up or something? I will read the back issues now that I am home (as of yesterday). Fab pictures. It says that my comment is awaiting moderation! Tee hee. What does that mean? Aren’t I moderate enough. Hugs. It seems I have to approve comments! Love to you.